Le Club Accorhotels has launched a new promo for stays at participating hotels in United Arab Emirates, Saudi Arabia, Egypt, Bahrain, Qatar, Lebanon and Yemen (who would go there right now?). 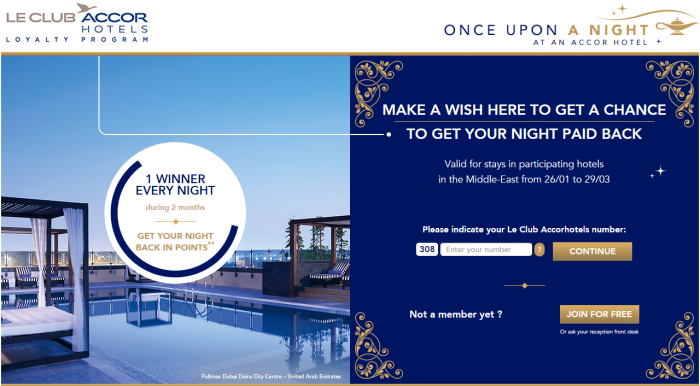 Every day between January 26 and March 29, 2015, lucky Le Club Accorhotels member will get the room rate back in points and one winner will get 100,000 points at the end of the promotion. This offer has two pages on Accor’s website that you can access here and here. There appears to be a Facebook element for this offer as well that would allow you to participate without actually staying at any of the above mentioned hotels. I was not able to find the link to the game, however. Obviously, the chances of winning are small, but worth signing up regardless.